2 CASE 1 Explanation: Review this case before looking at subsequent cases. 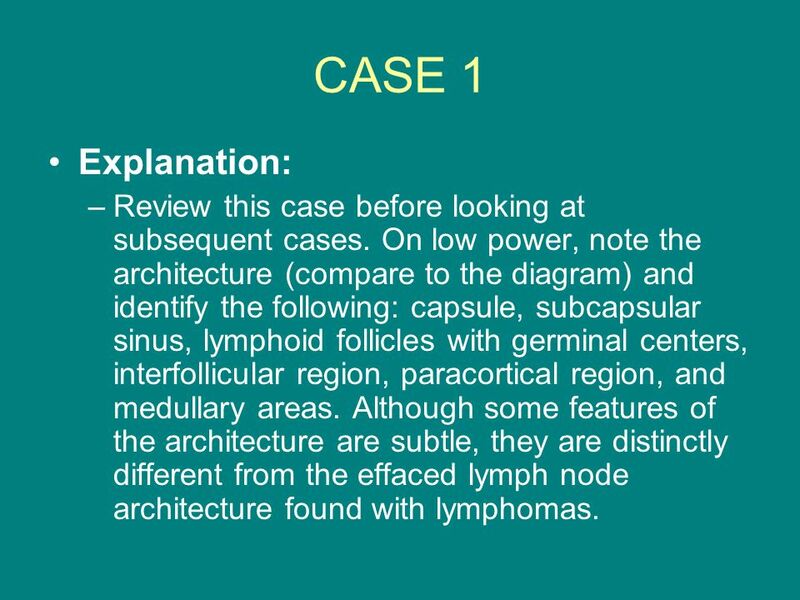 On low power, note the architecture (compare to the diagram) and identify the following: capsule, subcapsular sinus, lymphoid follicles with germinal centers, interfollicular region, paracortical region, and medullary areas. Although some features of the architecture are subtle, they are distinctly different from the effaced lymph node architecture found with lymphomas. 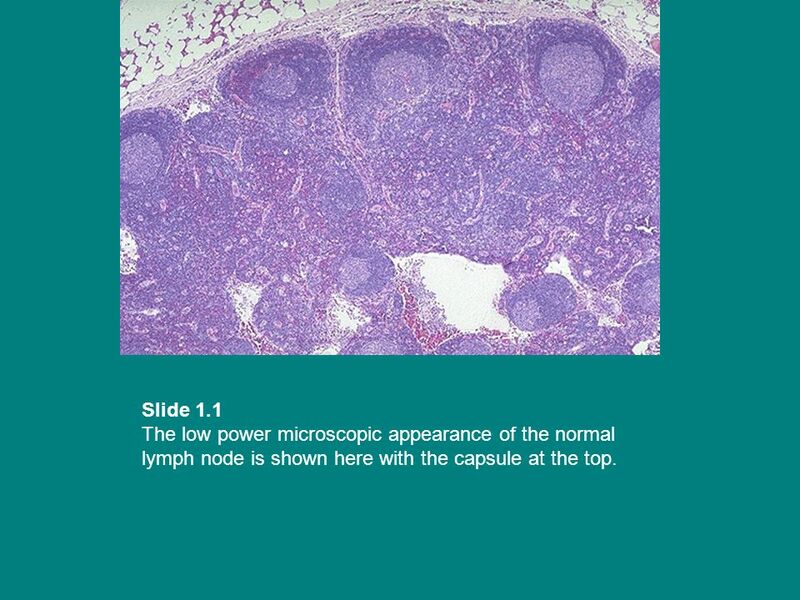 3 Slide 1.1 The low power microscopic appearance of the normal lymph node is shown here with the capsule at the top. 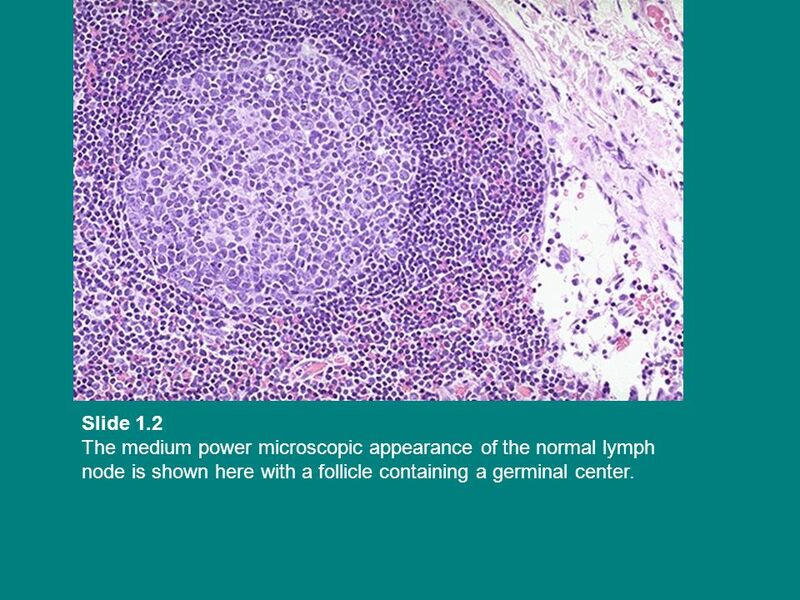 4 Slide 1.2 The medium power microscopic appearance of the normal lymph node is shown here with a follicle containing a germinal center. 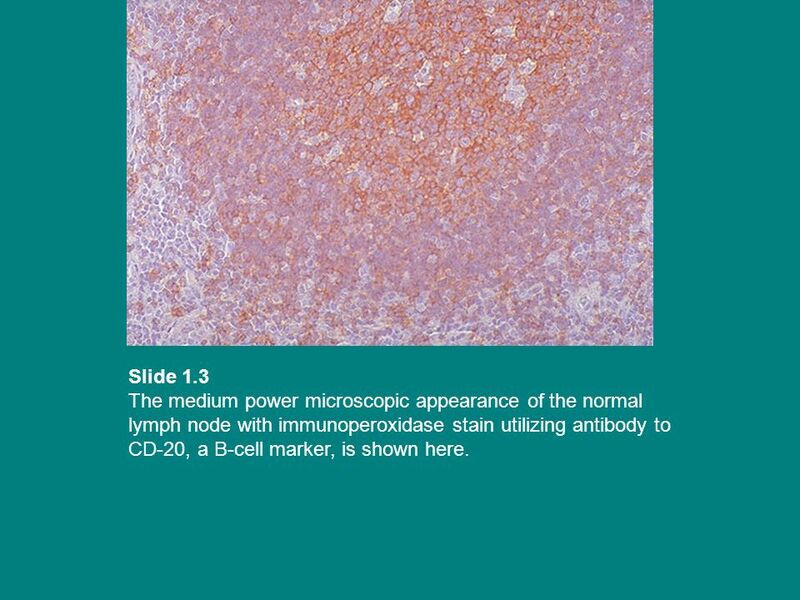 5 Slide 1.3 The medium power microscopic appearance of the normal lymph node with immunoperoxidase stain utilizing antibody to CD-20, a B-cell marker, is shown here. 6 Slide 1.4 The medium power microscopic appearance of the normal lymph node with immunoperoxidase stain utilizing antibody to CD-45-RO, a T-cell marker, is shown here. 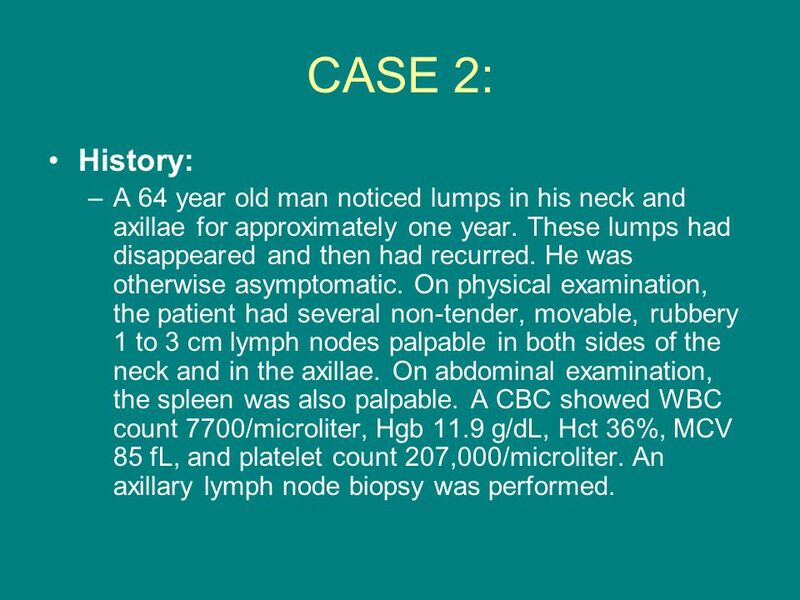 8 CASE 2: History: A 64 year old man noticed lumps in his neck and axillae for approximately one year. These lumps had disappeared and then had recurred. He was otherwise asymptomatic. On physical examination, the patient had several non-tender, movable, rubbery 1 to 3 cm lymph nodes palpable in both sides of the neck and in the axillae. On abdominal examination, the spleen was also palpable. A CBC showed WBC count 7700/microliter, Hgb 11.9 g/dL, Hct 36%, MCV 85 fL, and platelet count 207,000/microliter. An axillary lymph node biopsy was performed. 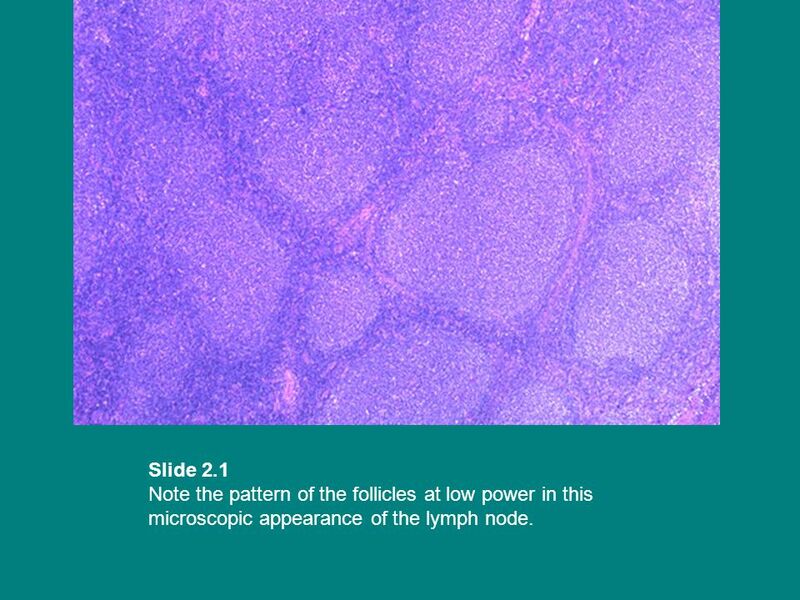 9 Slide 2.1 Note the pattern of the follicles at low power in this microscopic appearance of the lymph node. 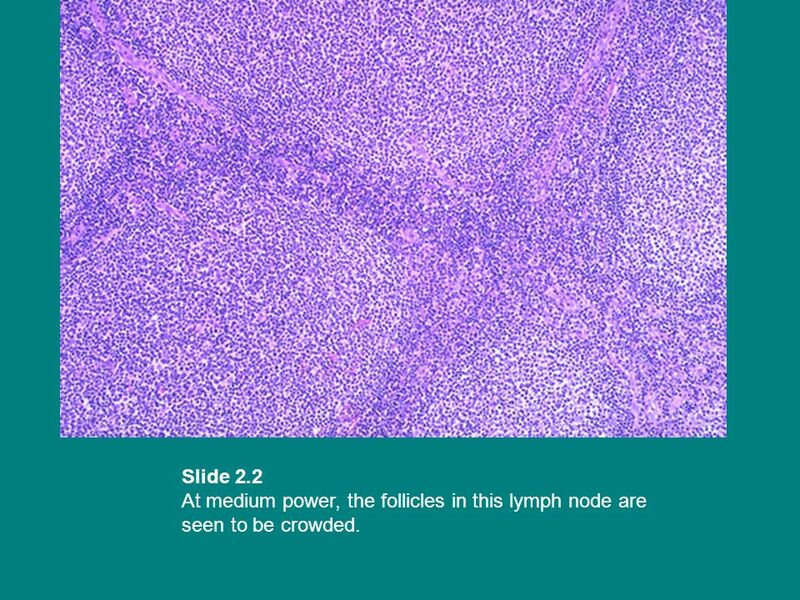 10 Slide 2.2 At medium power, the follicles in this lymph node are seen to be crowded. 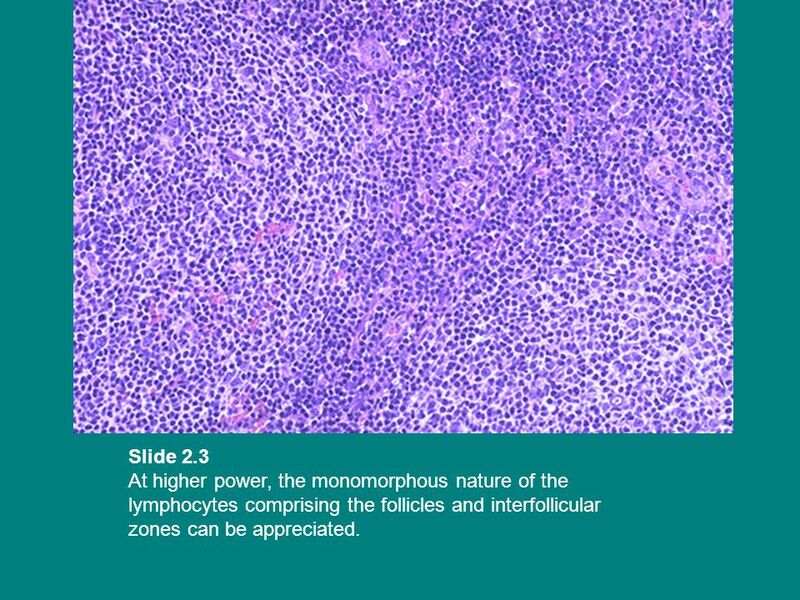 11 Slide 2.3 At higher power, the monomorphous nature of the lymphocytes comprising the follicles and interfollicular zones can be appreciated. 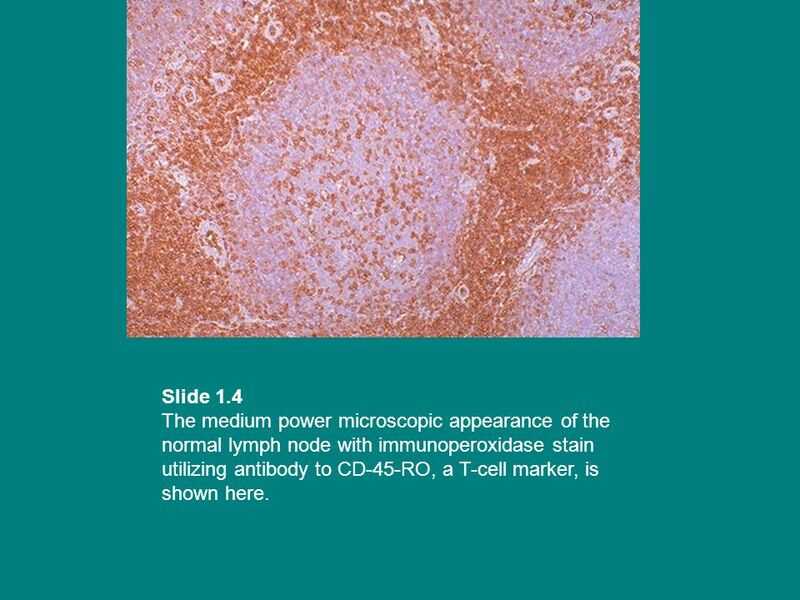 12 Slide 2.4 Note the appearance of the lymphocytes at high power in this microscopic appearance of the lymph node. 13 Questions: On low power, how does the architecture differ from that of the normal lymph node? 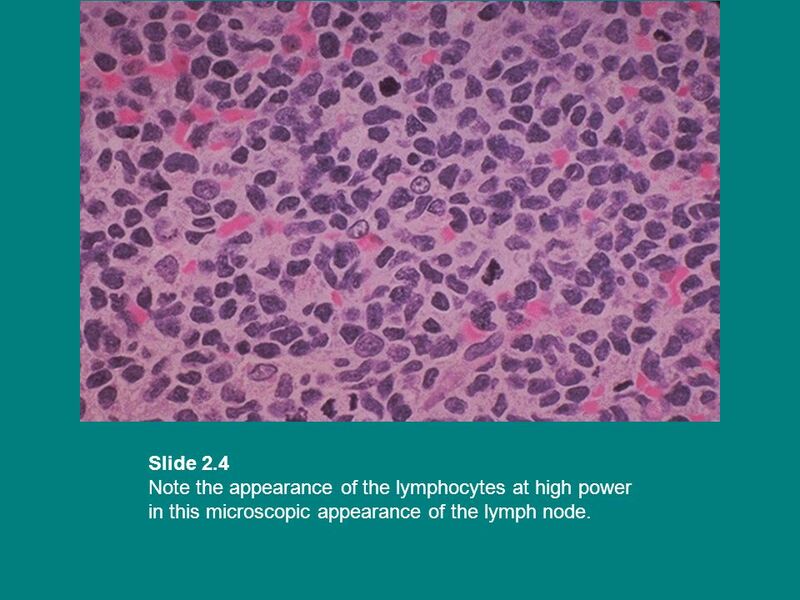 Under high magnification, how do the lymphocytes in the follicles appear as compared to those in a normal lymph node? What is your diagnosis? 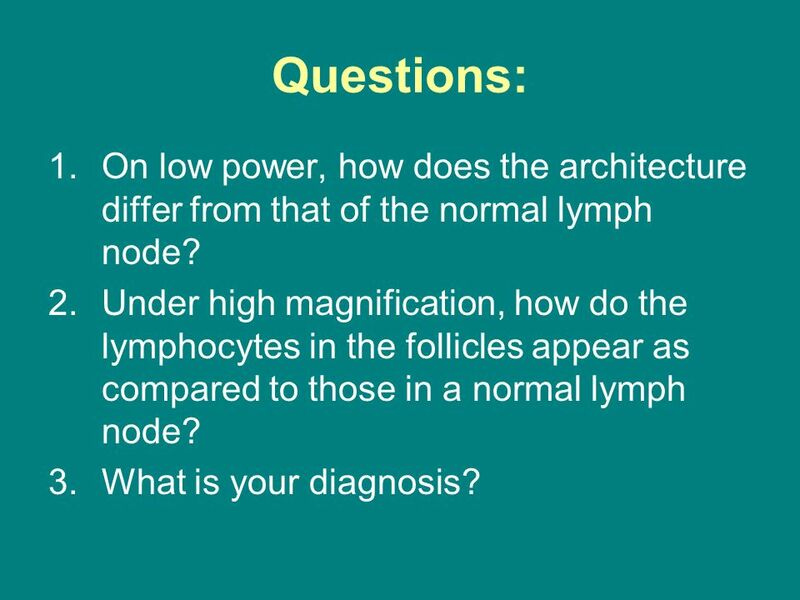 On low power, how does the architecture differ from that of the normal lymph node? 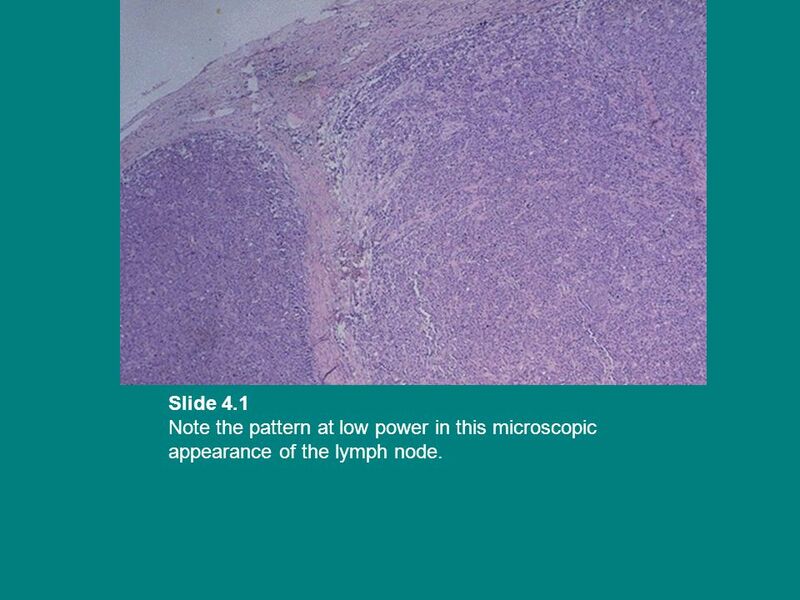 Under low power, notice that the normal nodal architecture is replaced by tumor cells which form a follicular pattern. In contrast to the benign lymph node in Case 1, there are many more follicles (with a "back- to-back" arrangement) with the normal mantle zone absent. 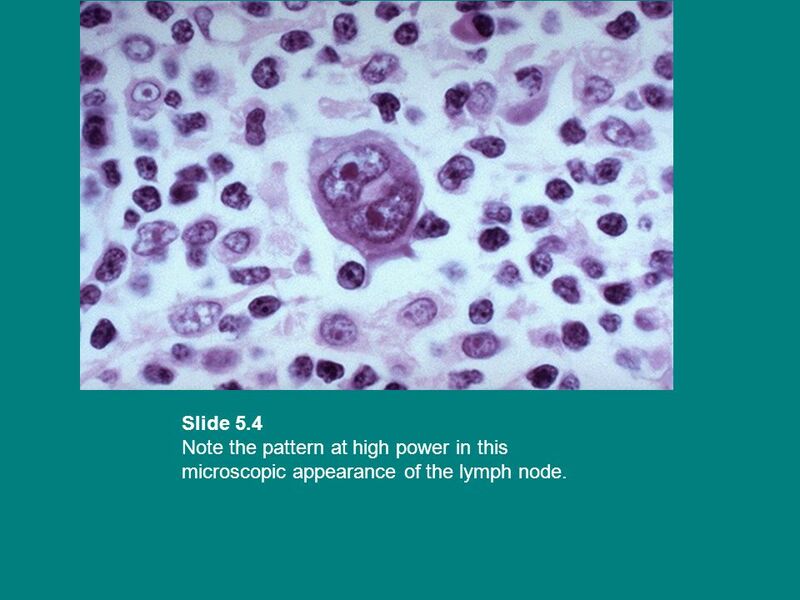 Under high magnification, how do the lymphocytes in the follicles appear as compared to those in a normal lymph node? Under higher power, the follicles (nodules) are composed of a uniform population of small cleaved lymphocytes. The nuclei of these neoplastic lymphocytes have twisted or cleaved contours. In contrast to the benign reactive germinal centers of Case 1 in which there is a mixture of cells, the malignant lymphoma seen here has only one cell population present. In this case, the malignant cells are mostly small cleaved lymphocytes. What is your diagnosis? 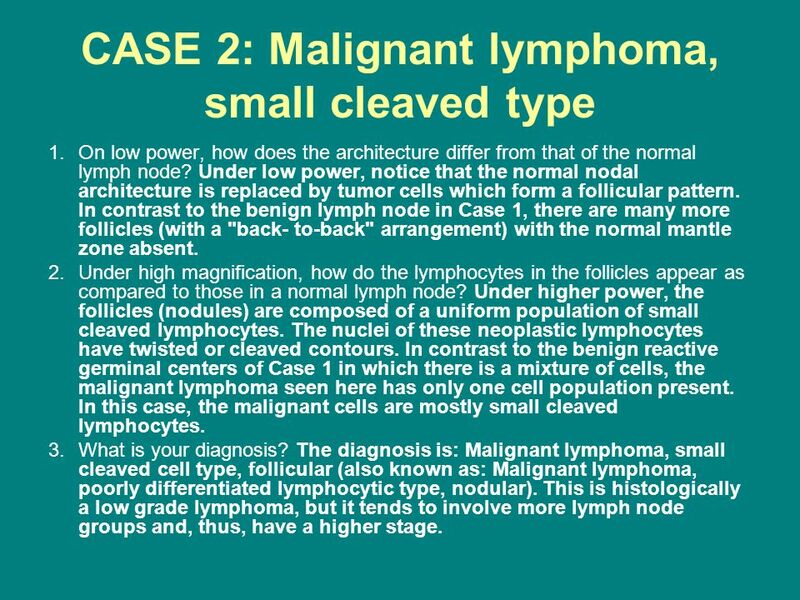 The diagnosis is: Malignant lymphoma, small cleaved cell type, follicular (also known as: Malignant lymphoma, poorly differentiated lymphocytic type, nodular). 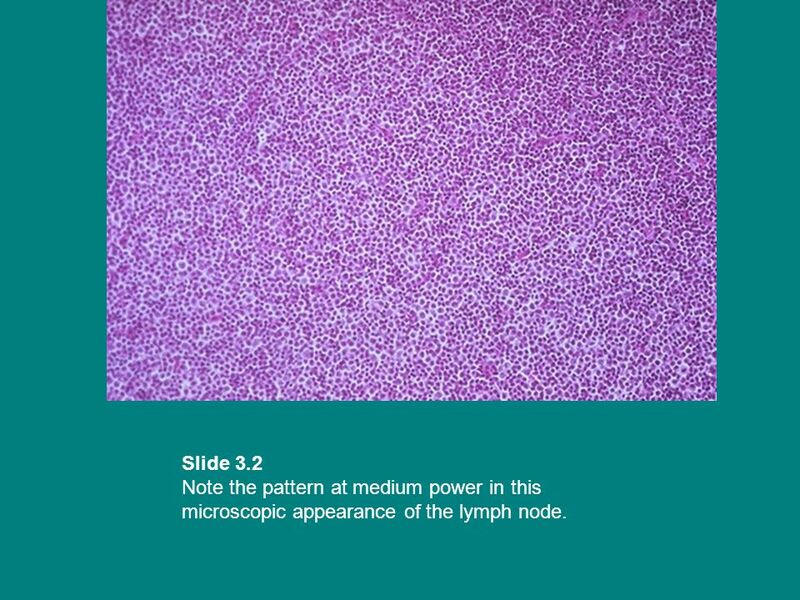 This is histologically a low grade lymphoma, but it tends to involve more lymph node groups and, thus, have a higher stage. 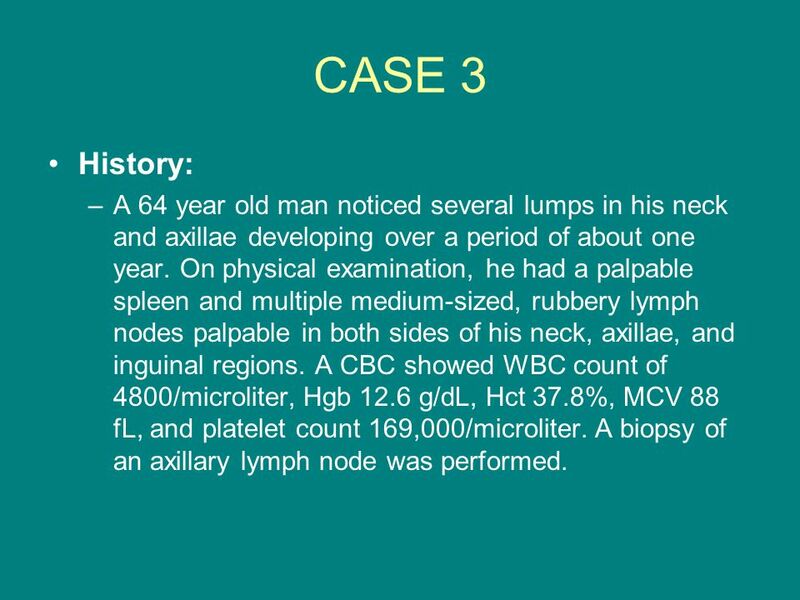 15 CASE 3 History: A 64 year old man noticed several lumps in his neck and axillae developing over a period of about one year. On physical examination, he had a palpable spleen and multiple medium-sized, rubbery lymph nodes palpable in both sides of his neck, axillae, and inguinal regions. A CBC showed WBC count of 4800/microliter, Hgb 12.6 g/dL, Hct 37.8%, MCV 88 fL, and platelet count 169,000/microliter. A biopsy of an axillary lymph node was performed. 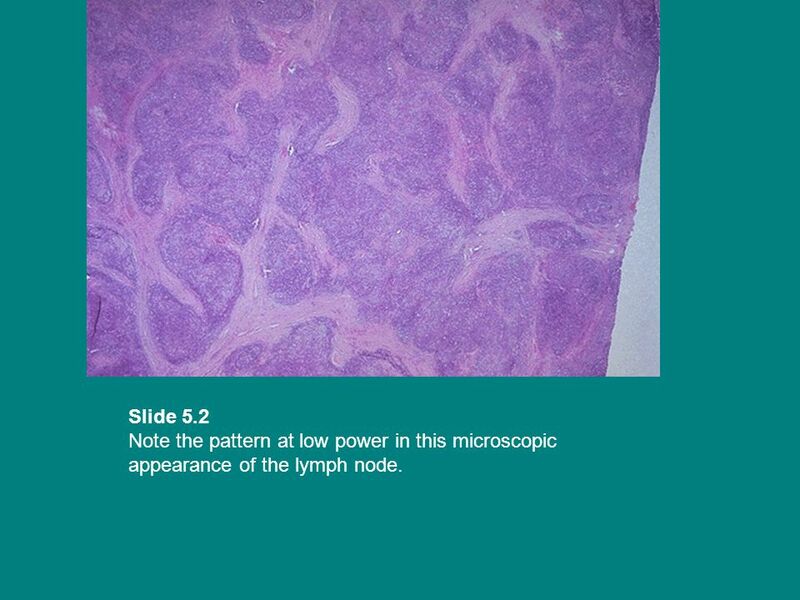 16 Slide 3.1 Note the pattern at low power in this microscopic appearance of the lymph node. 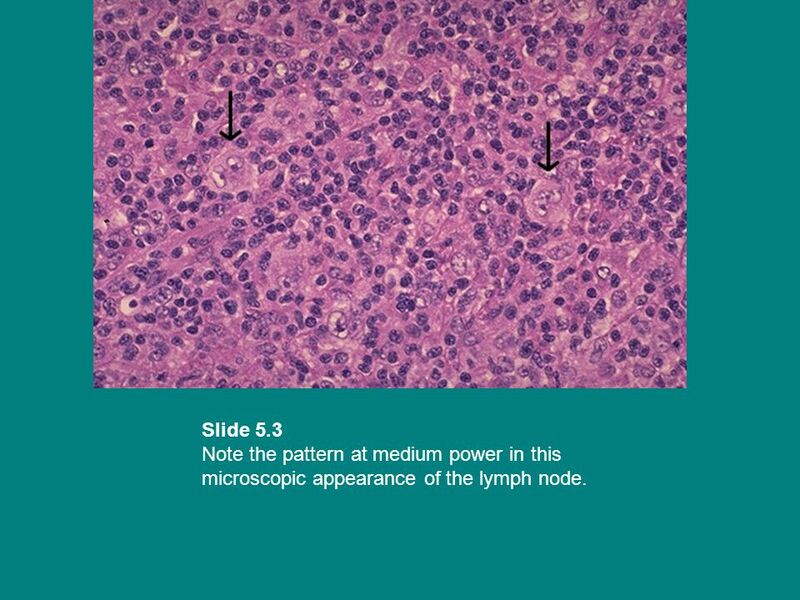 17 Slide 3.2 Note the pattern at medium power in this microscopic appearance of the lymph node. 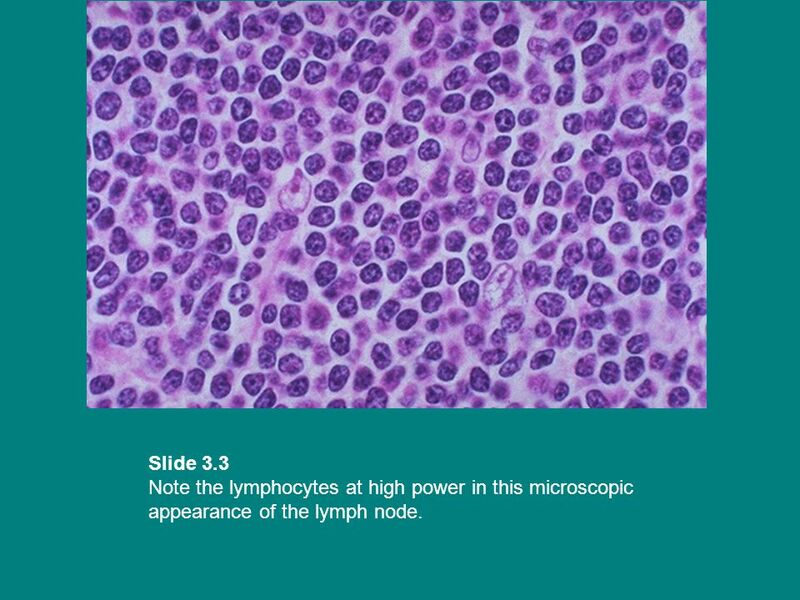 18 Slide 3.3 Note the lymphocytes at high power in this microscopic appearance of the lymph node. 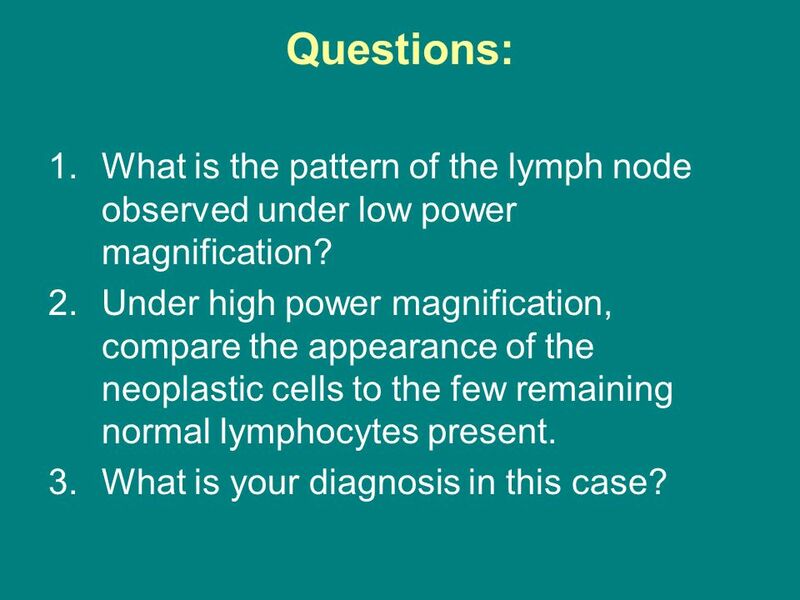 19 Questions: What is the pattern of the lymph node observed under low power magnification? Under high power magnification, compare the appearance of the neoplastic cells to the few remaining normal lymphocytes present. What is your diagnosis in this case? 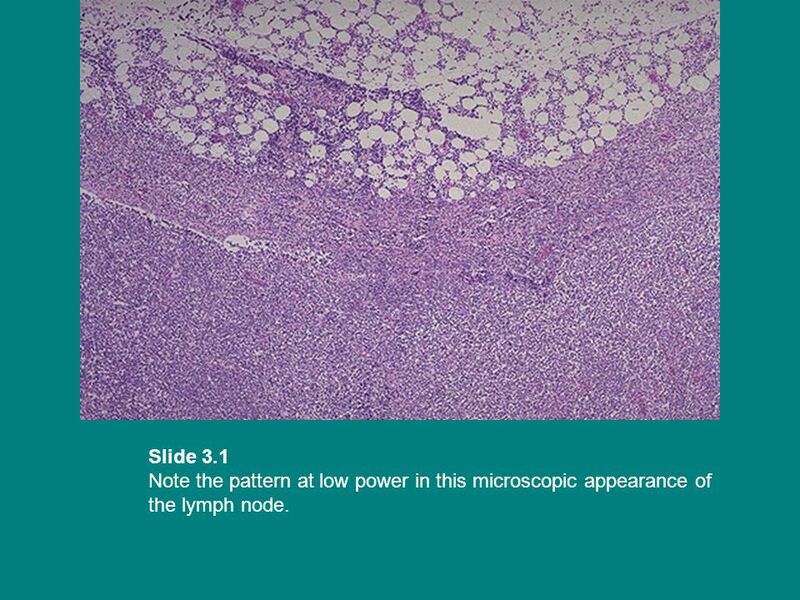 What is the pattern of the lymph node observed under low power magnification? The pattern is diffuse and no lymphoid follicles are identified. 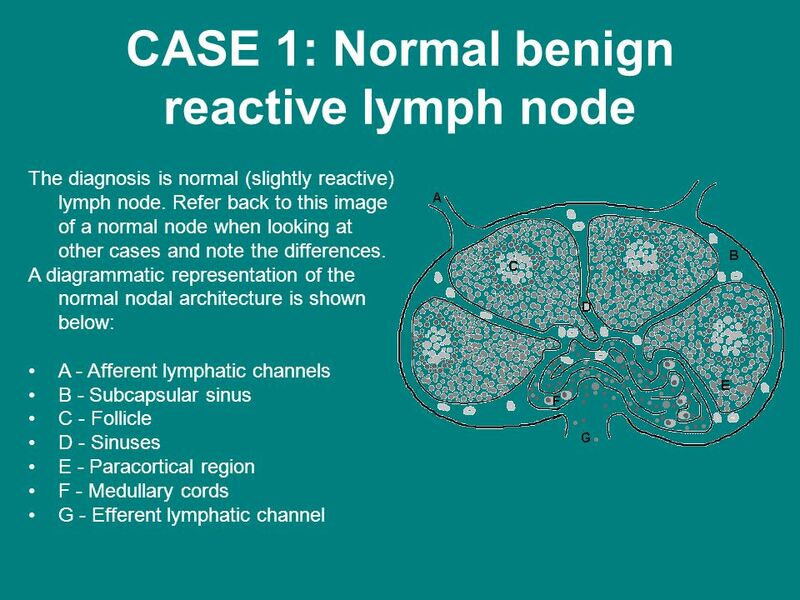 Note that the normal architecture of the lymph node is obliterated. Under high power magnification, compare the appearance of the neoplastic cells to the few remaining normal lymphocytes present. 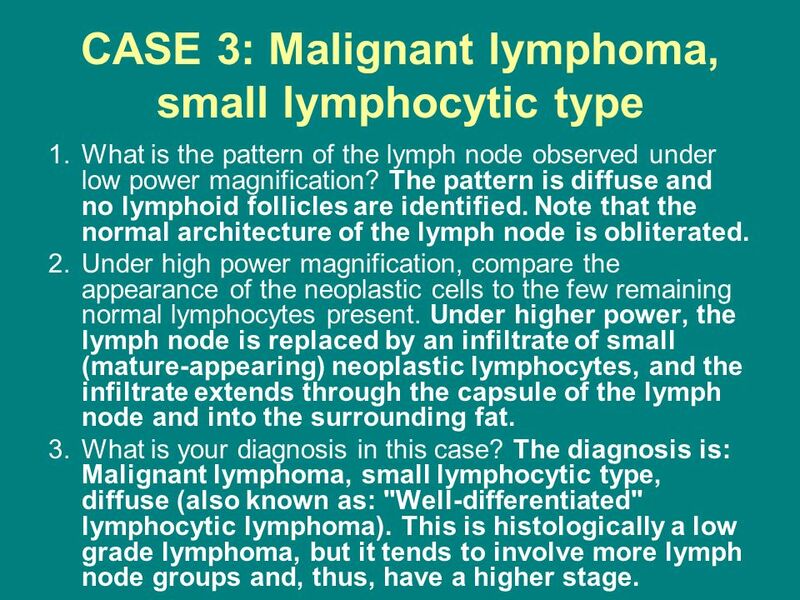 Under higher power, the lymph node is replaced by an infiltrate of small (mature-appearing) neoplastic lymphocytes, and the infiltrate extends through the capsule of the lymph node and into the surrounding fat. What is your diagnosis in this case? The diagnosis is: Malignant lymphoma, small lymphocytic type, diffuse (also known as: "Well-differentiated" lymphocytic lymphoma). 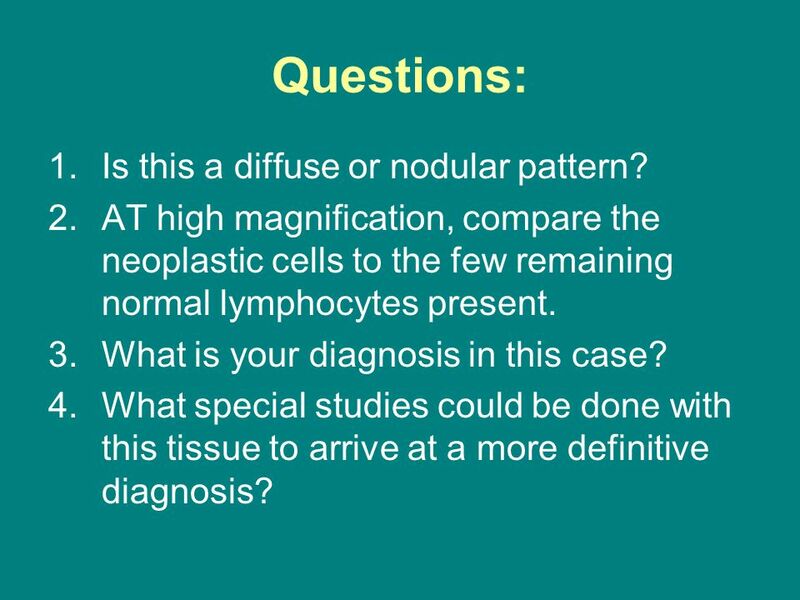 This is histologically a low grade lymphoma, but it tends to involve more lymph node groups and, thus, have a higher stage. 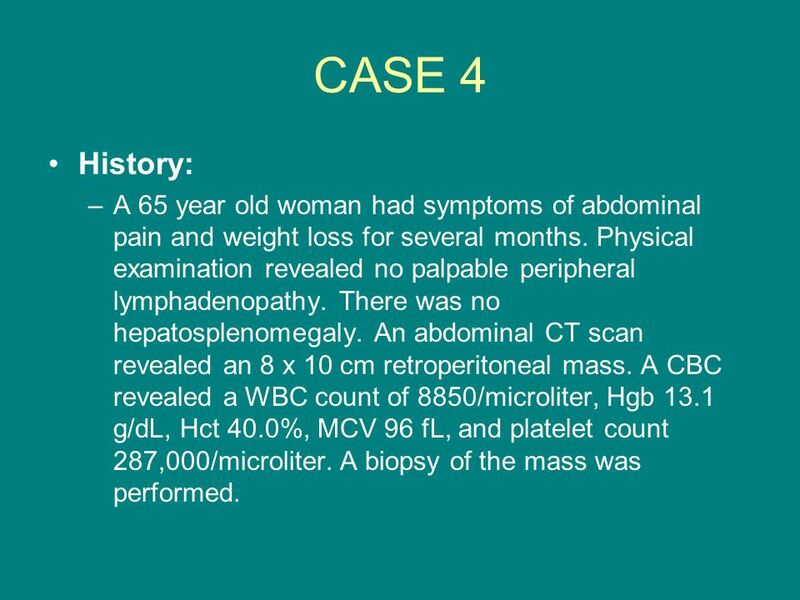 21 CASE 4 History: A 65 year old woman had symptoms of abdominal pain and weight loss for several months. Physical examination revealed no palpable peripheral lymphadenopathy. There was no hepatosplenomegaly. An abdominal CT scan revealed an 8 x 10 cm retroperitoneal mass. A CBC revealed a WBC count of 8850/microliter, Hgb 13.1 g/dL, Hct 40.0%, MCV 96 fL, and platelet count 287,000/microliter. A biopsy of the mass was performed. 22 Slide 4.1 Note the pattern at low power in this microscopic appearance of the lymph node. 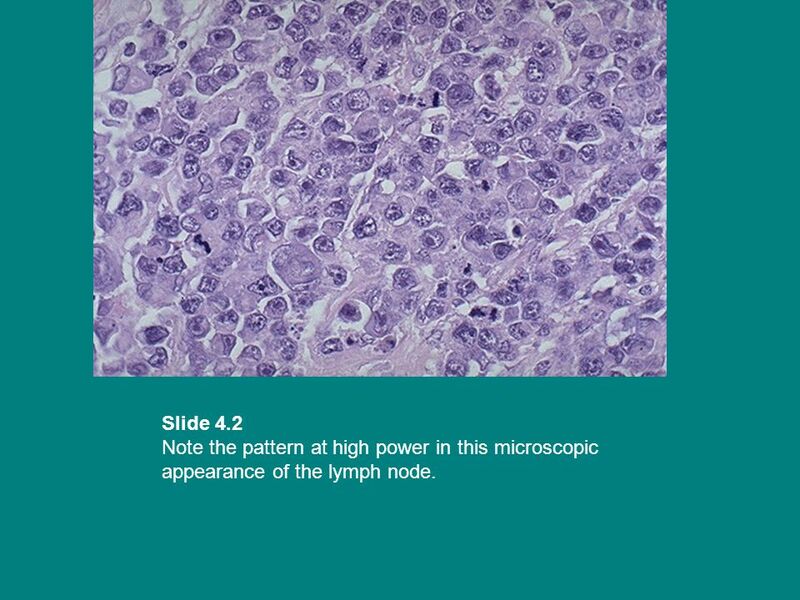 23 Slide 4.2 Note the pattern at high power in this microscopic appearance of the lymph node. 24 Questions: Is this a diffuse or nodular pattern? AT high magnification, compare the neoplastic cells to the few remaining normal lymphocytes present. What is your diagnosis in this case? What special studies could be done with this tissue to arrive at a more definitive diagnosis? Is this a diffuse or nodular pattern? This is a diffuse pattern. At high magnification, compare the neoplastic cells to the few remaining normal lymphocytes present. At higher power, the malignant lymphocytes are much larger than the few remaining small lymphocytes in this lesion. The neoplastic lymphocytes have a moderately abundant cytoplasm, and the nuclei are round to ovoid with prominent eosinophilic nucleoli. What is your diagnosis in this case? 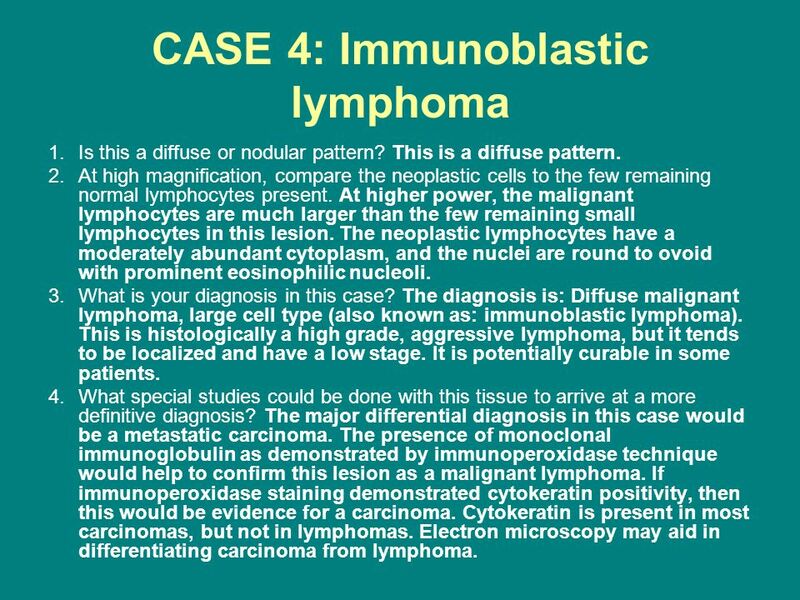 The diagnosis is: Diffuse malignant lymphoma, large cell type (also known as: immunoblastic lymphoma). This is histologically a high grade, aggressive lymphoma, but it tends to be localized and have a low stage. It is potentially curable in some patients. What special studies could be done with this tissue to arrive at a more definitive diagnosis? The major differential diagnosis in this case would be a metastatic carcinoma. The presence of monoclonal immunoglobulin as demonstrated by immunoperoxidase technique would help to confirm this lesion as a malignant lymphoma. If immunoperoxidase staining demonstrated cytokeratin positivity, then this would be evidence for a carcinoma. Cytokeratin is present in most carcinomas, but not in lymphomas. Electron microscopy may aid in differentiating carcinoma from lymphoma. 26 CASE 5 History: A 27 year old woman presented to you, her physician, with a month-long history of chest pain. 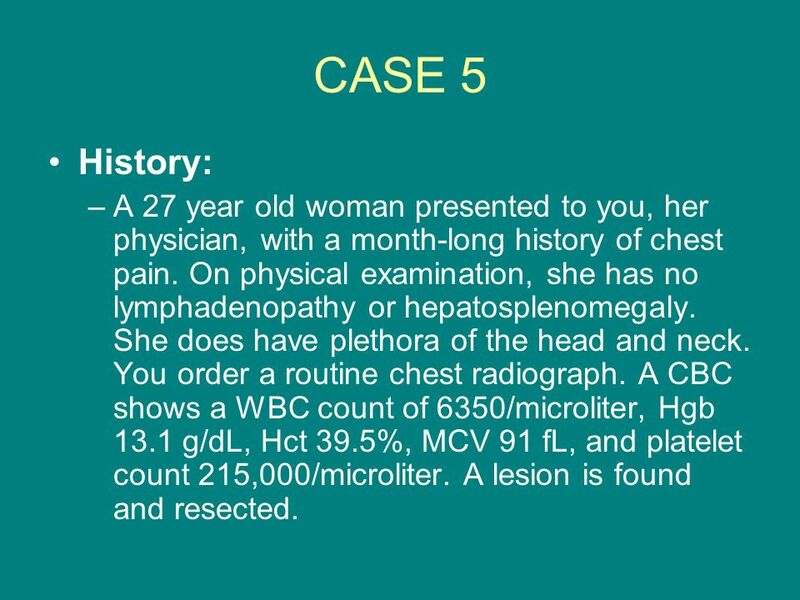 On physical examination, she has no lymphadenopathy or hepatosplenomegaly. She does have plethora of the head and neck. You order a routine chest radiograph. A CBC shows a WBC count of 6350/microliter, Hgb 13.1 g/dL, Hct 39.5%, MCV 91 fL, and platelet count 215,000/microliter. A lesion is found and resected. 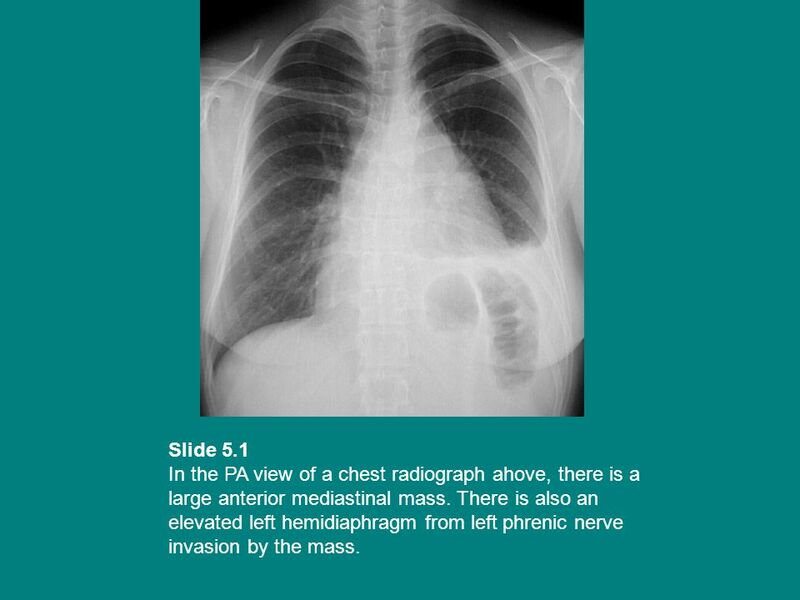 27 Slide 5.1 In the PA view of a chest radiograph ahove, there is a large anterior mediastinal mass. There is also an elevated left hemidiaphragm from left phrenic nerve invasion by the mass. 28 Slide 5.2 Note the pattern at low power in this microscopic appearance of the lymph node. 29 Slide 5.3 Note the pattern at medium power in this microscopic appearance of the lymph node. 30 Slide 5.4 Note the pattern at high power in this microscopic appearance of the lymph node. 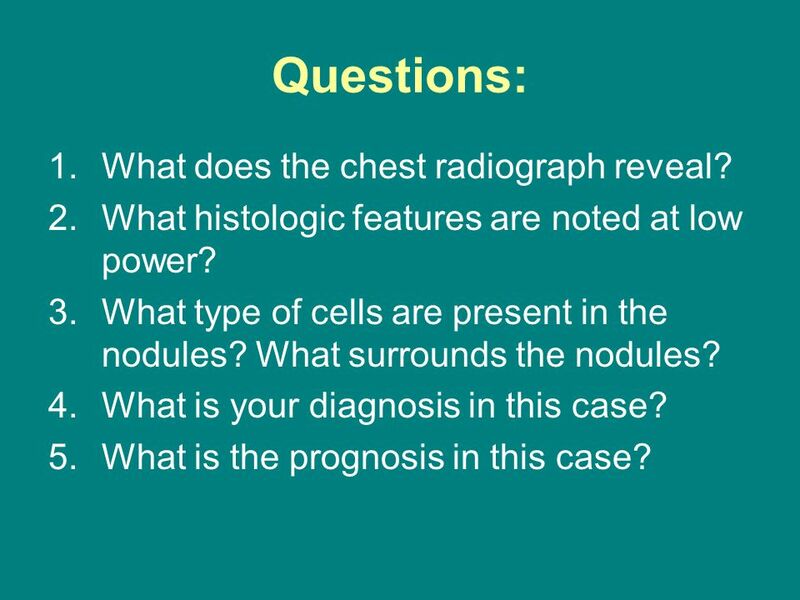 31 Questions: What does the chest radiograph reveal? What histologic features are noted at low power? What type of cells are present in the nodules? What surrounds the nodules? What is your diagnosis in this case? What is the prognosis in this case? What does the chest radiograph reveal? There is an anterior mediastinal mass. A mass in this location may have produced some superior vena cava obstruction to produce the plethora noted on physical examination. At thoracotomy a 5 x 8 cm mass was resected. What histologic features are noted at low power? Under low power, the capsule is markedly thickened and the lymph node parenchyma is traversed by bands of collagen, dividing the node into nodules. The normal nodal architecture is obliterated by this process. What type of cells are present in the nodules? What surrounds the nodules? At higher power, you can see that small lymphocytes are mixed with some large cells with lobulated nuclei, or with multinucleated cells that have prominent nucleoli. Some of these large cells appear to be lying in a space (lacunar Reed-Sternberg cells). What is your diagnosis in this case? The diagnosis is: Hodgkin's disease, nodular sclerosis type. What is the prognosis in this case? 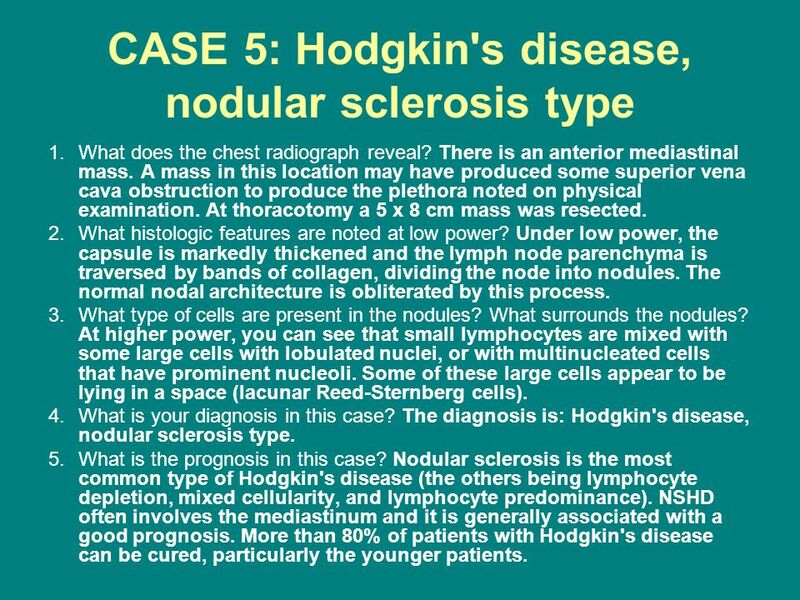 Nodular sclerosis is the most common type of Hodgkin's disease (the others being lymphocyte depletion, mixed cellularity, and lymphocyte predominance). NSHD often involves the mediastinum and it is generally associated with a good prognosis. More than 80% of patients with Hodgkin's disease can be cured, particularly the younger patients. 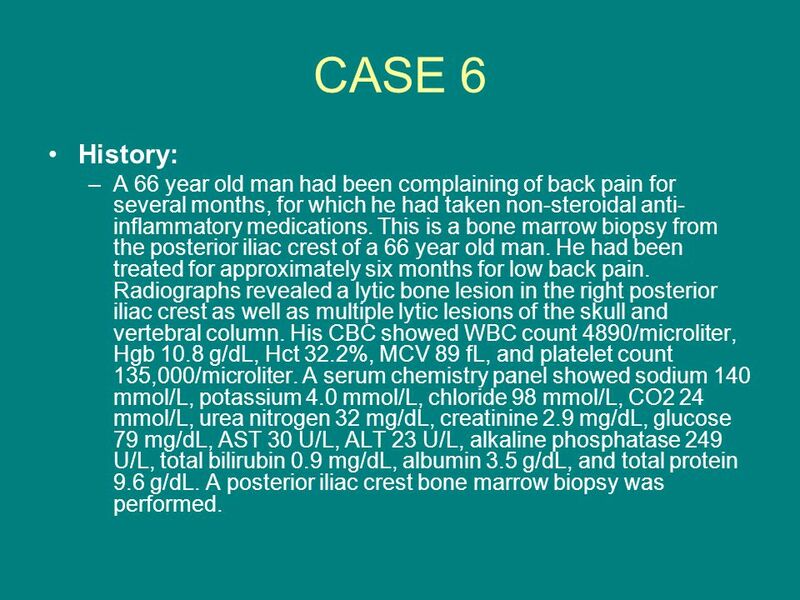 33 CASE 6 History: A 66 year old man had been complaining of back pain for several months, for which he had taken non-steroidal anti-inflammatory medications. This is a bone marrow biopsy from the posterior iliac crest of a 66 year old man. He had been treated for approximately six months for low back pain. Radiographs revealed a lytic bone lesion in the right posterior iliac crest as well as multiple lytic lesions of the skull and vertebral column. His CBC showed WBC count 4890/microliter, Hgb 10.8 g/dL, Hct 32.2%, MCV 89 fL, and platelet count 135,000/microliter. A serum chemistry panel showed sodium 140 mmol/L, potassium 4.0 mmol/L, chloride 98 mmol/L, CO2 24 mmol/L, urea nitrogen 32 mg/dL, creatinine 2.9 mg/dL, glucose 79 mg/dL, AST 30 U/L, ALT 23 U/L, alkaline phosphatase 249 U/L, total bilirubin 0.9 mg/dL, albumin 3.5 g/dL, and total protein 9.6 g/dL. A posterior iliac crest bone marrow biopsy was performed. 34 Slide 6.1 Note the "punched out" circular lytic lesions in the skull. 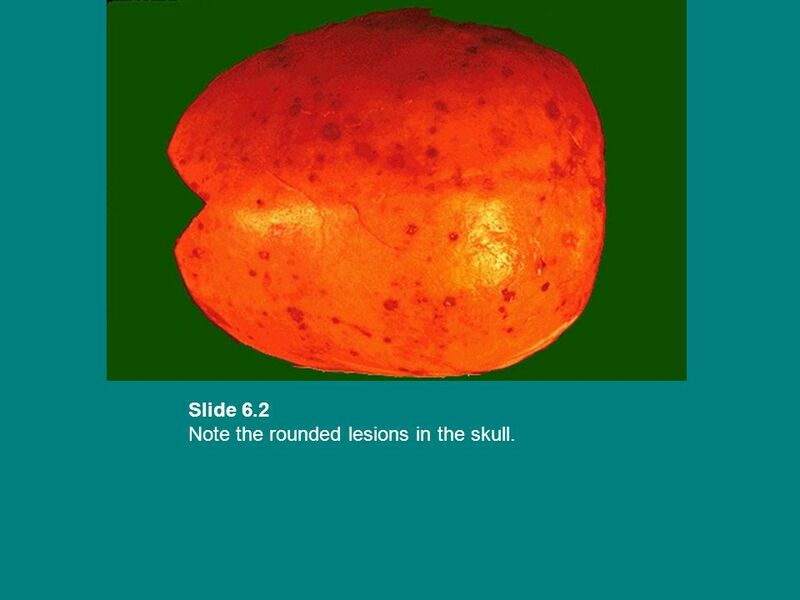 35 Slide 6.2 Note the rounded lesions in the skull. 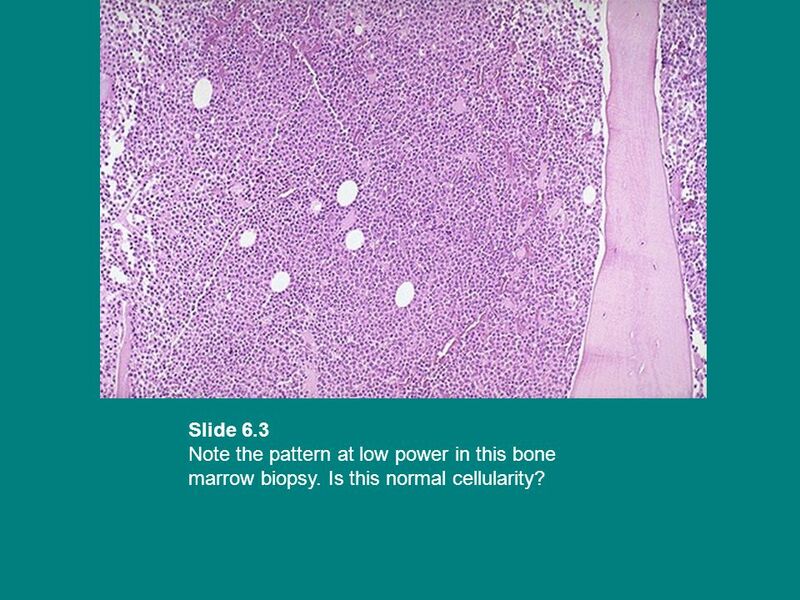 Slide 6.3 Note the pattern at low power in this bone marrow biopsy. Is this normal cellularity? 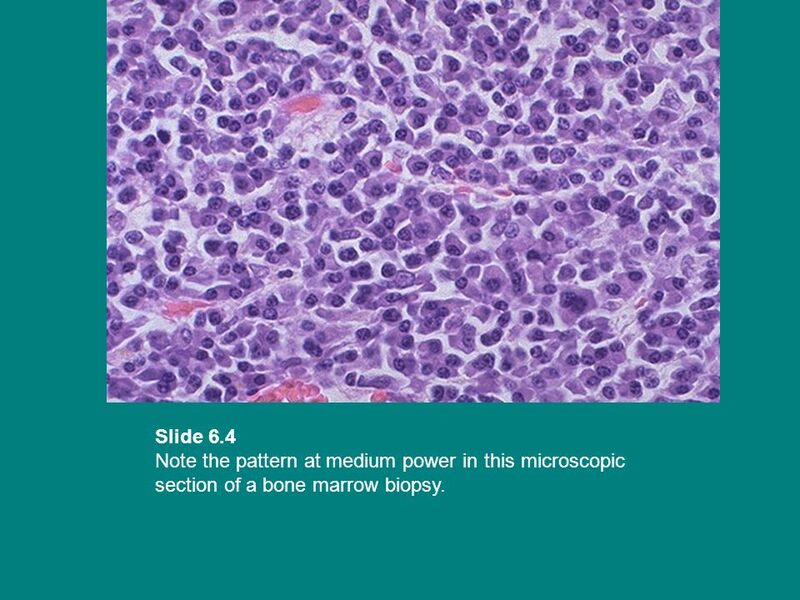 37 Slide 6.4 Note the pattern at medium power in this microscopic section of a bone marrow biopsy. 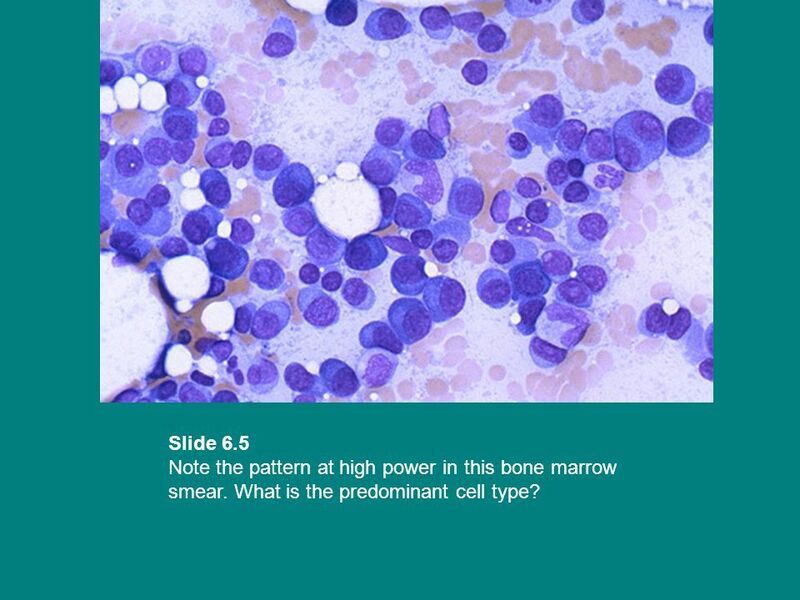 Slide 6.5 Note the pattern at high power in this bone marrow smear. What is the predominant cell type? 39 Questions: What is the predominant cell type present in the bone marrow? What other laboratory studies should be done in order to arrive at a definitive diagnosis? What is your diagnosis in this case? 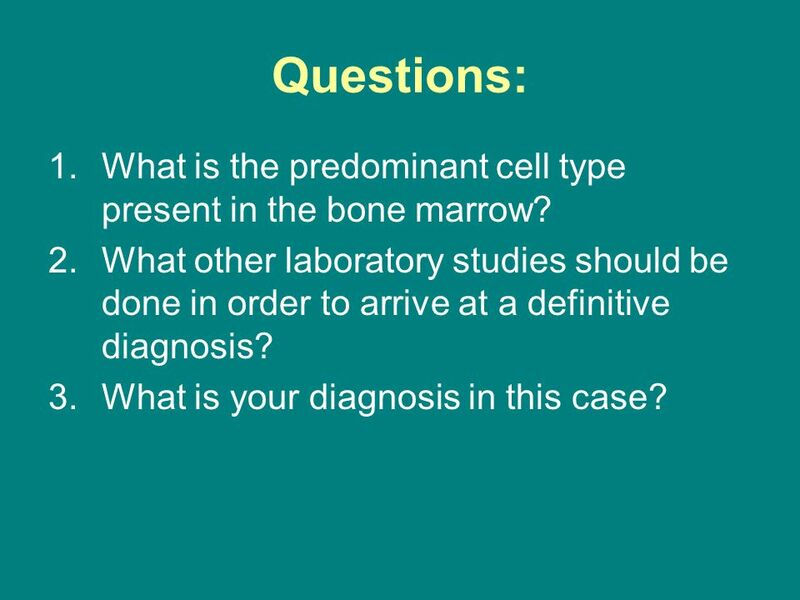 What is the predominant cell type present in the bone marrow? The bone marrow is nearly replaced by plasma cells and is virtually 100% cellular, rather than the 40% expected at this site for the patient's age. The myeloid, erythroid, and megakaryocytic cell lines are difficult to find, explaining his pancytopenia. What other laboratory studies should be done in order to arrive at a definitive diagnosis? The high total serum protein with low normal albumin suggests increased globulins, which could be monocolonal. To confirm the diagnosis, you should order serum and urine protein electrophoresis. These will show a monoclonal spike of abnormal gamma globulin secreted by the neoplastic plasma cells (in only rare cases will the plasma cells not secrete an identifiable globulin). What is your diagnosis in this case? The diagnosis is multiple myeloma, which accounts for over 95% of cases in which a monoclonal gammopathy is present. 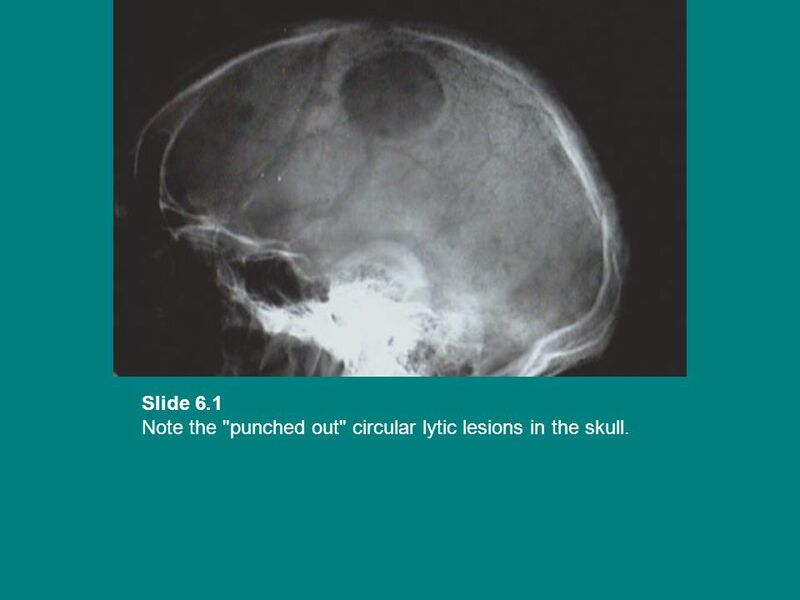 The plasma cells can produce lytic bone lesions, such as those seen in the skull. 41 CASE 7 History: A 39 year old male is known to be HIV positive and has had bouts of Pneumocystis carinii pneumonia in the past two years. He was recently diagnosed with cytomegalovirus retinitis. He has been on highly active anti-retorviral therapy (HAART) that included zidovudine (AZT) for one year, but had to stop. He developed abdominal pain with bowel obstruction. A laparotomy was performed and a 20 cm segment of ileum was resected. This section is from one of several mass lesions ranging from 1 to 3 cm in size and located on the mucosal surface extending into muscularis of the bowel. 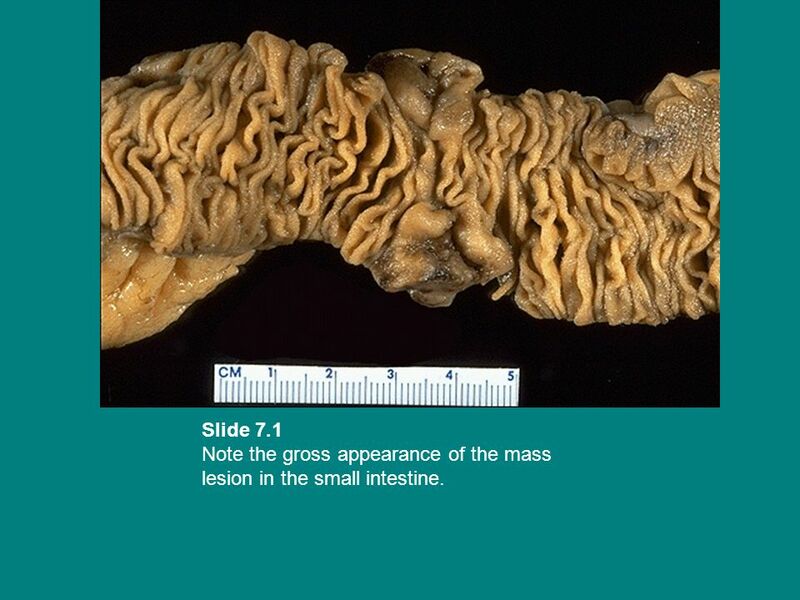 42 Slide 7.1 Note the gross appearance of the mass lesion in the small intestine. 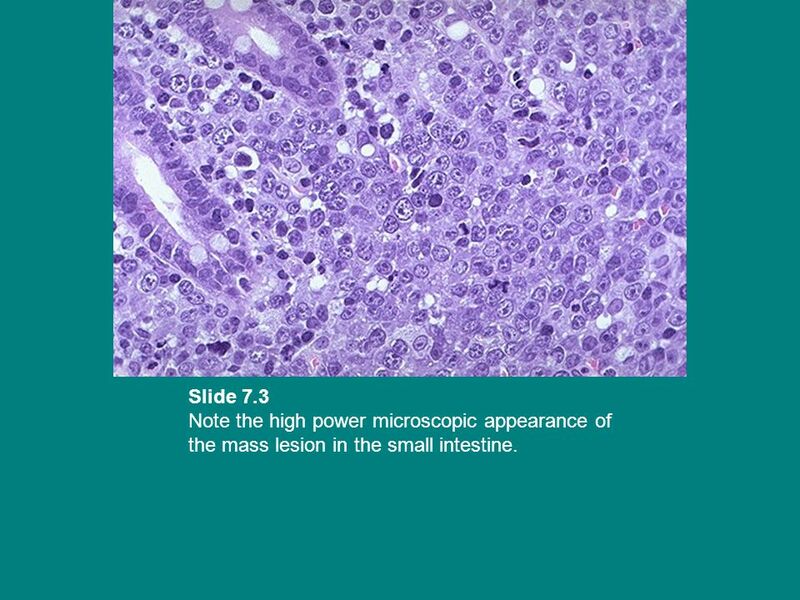 43 Slide 7.2 Note the low power microscopic appearance of the mass lesion in the small intestine. 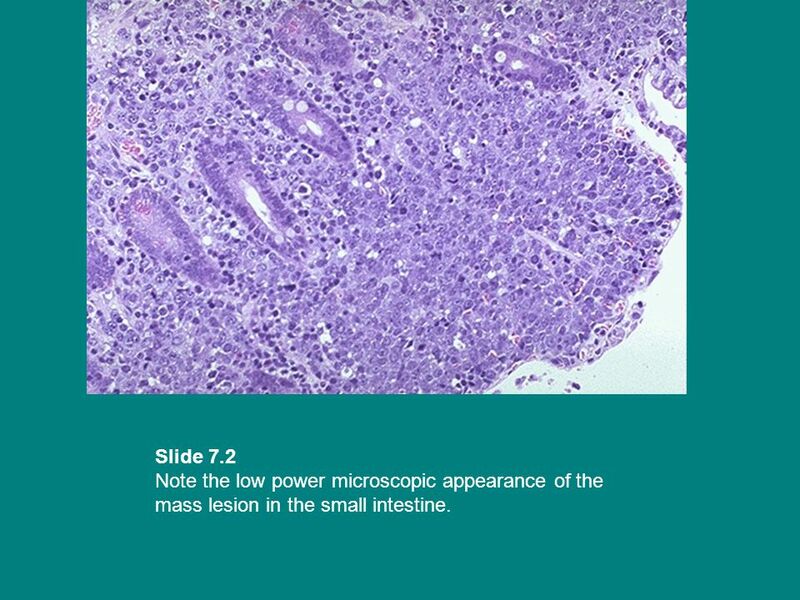 44 Slide 7.3 Note the high power microscopic appearance of the mass lesion in the small intestine. 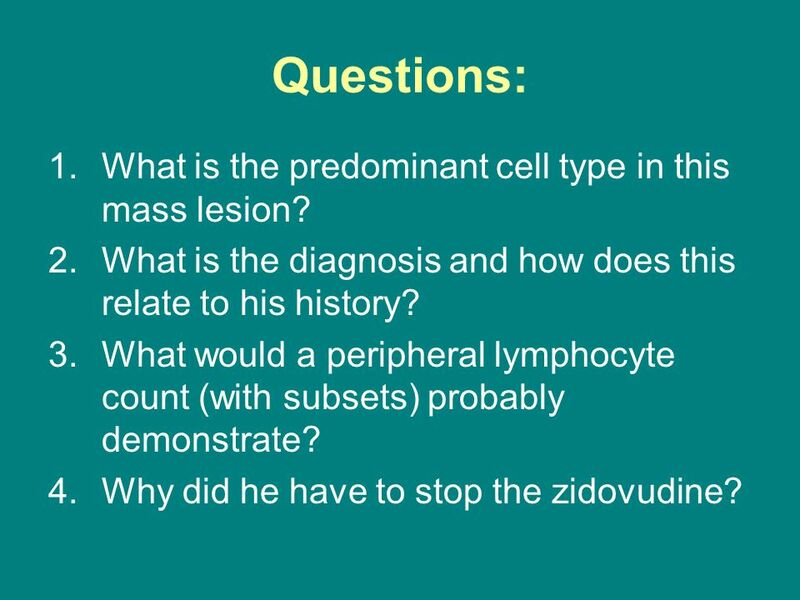 45 Questions: What is the predominant cell type in this mass lesion? What is the diagnosis and how does this relate to his history? What would a peripheral lymphocyte count (with subsets) probably demonstrate? Why did he have to stop the zidovudine? What is the predominant cell type in this mass lesion? There are large lymphocytes with nuclei having clumped chromatin. What is the diagnosis and how does this relate to his history? 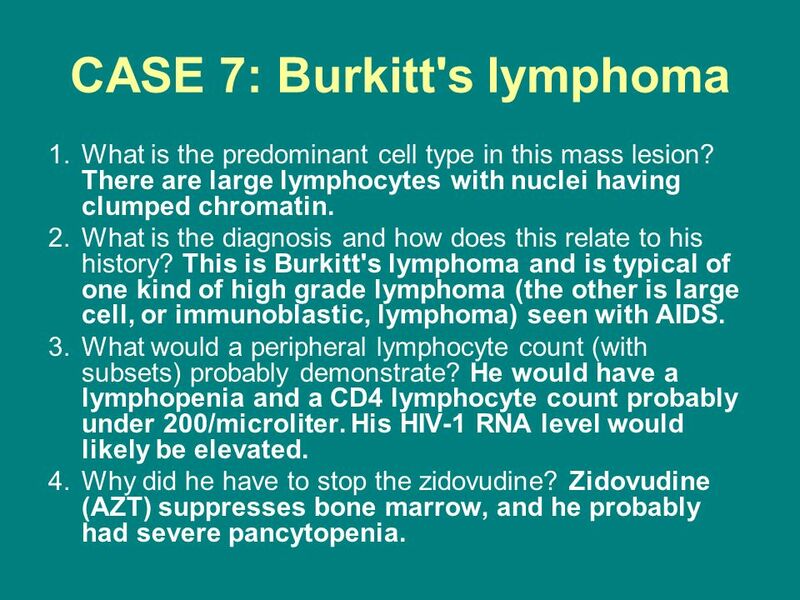 This is Burkitt's lymphoma and is typical of one kind of high grade lymphoma (the other is large cell, or immunoblastic, lymphoma) seen with AIDS. What would a peripheral lymphocyte count (with subsets) probably demonstrate? He would have a lymphopenia and a CD4 lymphocyte count probably under 200/microliter. His HIV-1 RNA level would likely be elevated. Why did he have to stop the zidovudine? Zidovudine (AZT) suppresses bone marrow, and he probably had severe pancytopenia. 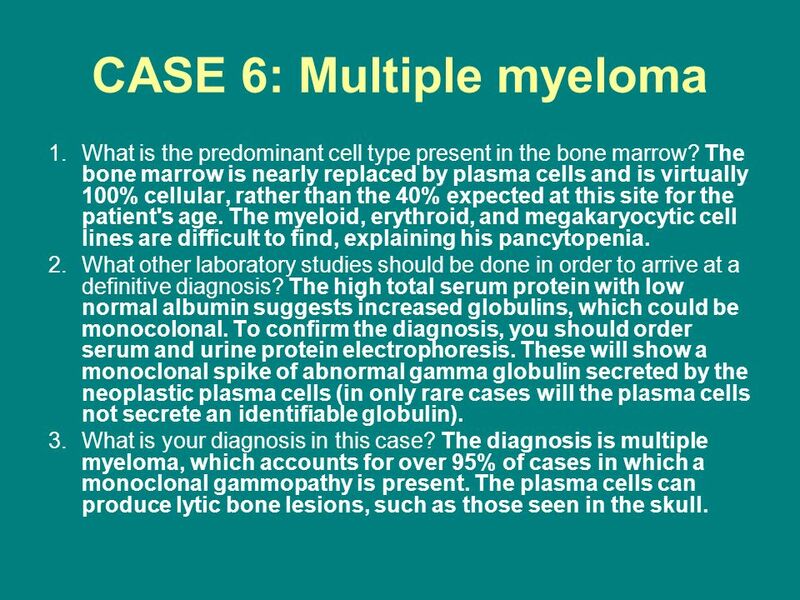 Multiple Myeloma Serena Ezzeddine Morning Report May 30, 2009. Preliminary materials Practical Cytological and Histological Approach to Lymphoid Lesions Workshop 8, 55 th annual meeting Canadian Association of Pathologists. A 35 year old woman presents with increasing fatigue, lethargy, and muscle weakness. Her CBC reveals decreased numbers of erythrocytes, leukocytes, and. Hodgkin Disease Definition: neoplastic disorder with development of specific infiltrate containing pathologic Reed-Sternberg cells. It usually arises in. H ISTOLOGICAL S TRUCTURE OF L YMPHOID O RGANS DR RANIA GABR. Diagnosis of Paraprotein Diseases CLS 404 Immunology Protein Abnormalities. 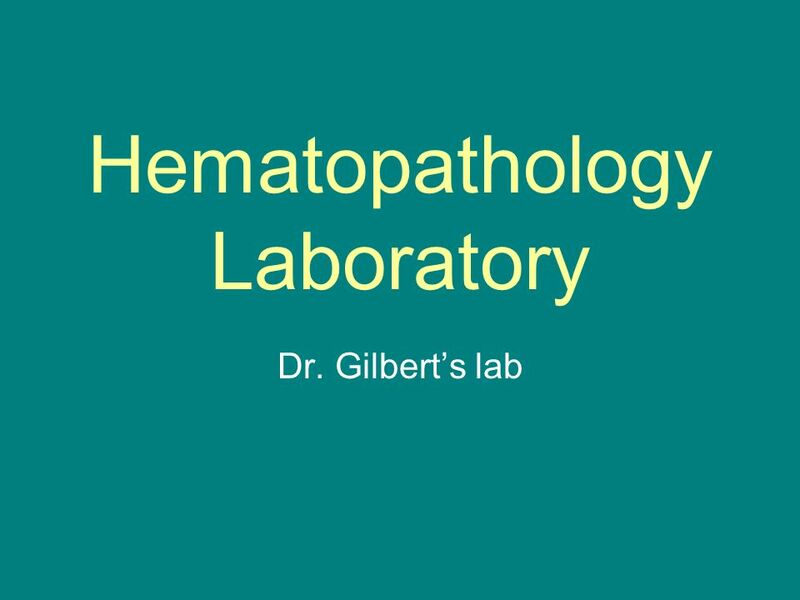 Anemia Lab MHD I November 3, Case 1 A CBC is ordered on a 32-year old healthy man as part of a life-insurance policy evaluation.